New Hampshire lived up to its MO, and Miami seems to be adopting it as well. The Wildcats played in their sixth overtime game of the season and the No. 19 RedHawks – who had seen all of their first 13 games decided in regulation – went to an extra session for the second consecutive contest in a 3-3 tie at Whittemore Center on Friday. Earning a tie for the fifth time in 11 games this season, New Hampshire (1-5-5) salvaged the draw thanks to a 6-on-5 backhander by Liam Blackburn off a feed by Eric Esposito with 33 seconds left in regulation. Nine different players recorded points for Miami. The series finale is at 7 p.m. on Saturday. RECAP: The first three goals of the game were scored in a 4:23 window. New Hampshire took the lead at the eight-minute mark when Matt Dawson tipped in a bad-angle shot. Just 71 seconds later, the RedHawks (9-5-1) tied it on a goal by Josh Melnick, who belted home a rebound which caromed off the end boards off a blast by River Rymsha. The Wildcats regained the lead on the power play with 7:37 left to play in the opening stanza as Angus Crookshank cashed in on a rebound chance off a shot by Patrick Grasso. Miami had a would-be tying goal waved off as it was ruled that Karch Bachman interfered with the goalie as Casey Gilling connected. But Bachman tied it at two when he wired one from the inside of the faceoff circle over the shoulder of UNH goalie Ty Taylor 2:34 into the third period. Ninety-four seconds later, Ben Lown deposited home a loose puck in the slot off a shot by Brian Hawkinson that was blocked as Miami took its first and only lead of the night. But Blackburn’s pitch-fork backhander evened the score, and despite three shots by each team in overtime, the game ended in a tie. STATS: Nine players picked up points for Miami, the maximum possible with a three-goal output. Bachman has scored three goals in four games and leads the team with six overall. Melnick has picked up 12 points in his last nine contests. — The RedHawks were outshot for the sixth straight game and have seen opponents pile up 62 more SOG in that span or nearly nine per game. THOUGHTS: It’s always tough to see a win slip away in the final minute and that has happened to Miami far too often in recent years. It makes it worse considering the RedHawks had rallied from one down to take the lead earlier in the third period. In MU’s defense, this is the first time this season the team has seen a win slip away due to a late opponent’s goal, and the RedHawks won in overtime last weekend and pulled out a 2-1 win over UMass-Lowell late after trailing 1-0 heading into the final 20 minutes. — Overall, UNH had the better chances and finished with a 37-28 edge in shots on goal. This is the RedHawks’ eighth straight weekend of games, including four road trips and a flight to Colorado Springs last week. One starts to wonder if Miami needs a weekend off. It gets several after St. Cloud visits Oxford next Friday and Saturday. — Carter Johnson seems to be working his way back to his late 2017-18 form. The RedHawks can use all of the offensive weapons they can get. — Amazing how much better Melnick is on the power play this season. He was 14-6 (.700) in the circle in this game. Had never watched a game on YouTube before, but the picture was surprisingly clear. There was only one announcer who is clearly still learning his craft, and the replays were limited but another medium for college hockey games should be welcomed. LINEUP CHANGES: Miami seems to like using seven defensemen, as Andrew Sinard dressed for the fourth straight game as the extra skater. With Larkin a staple in net, the only changes the RedHawks have been making have been up front. Johnson was back after missing three games, and Zach LaValle was also back on the ice. Noah Jordan and Christian Mohs, both of whom dressed last Saturday, were scratched. 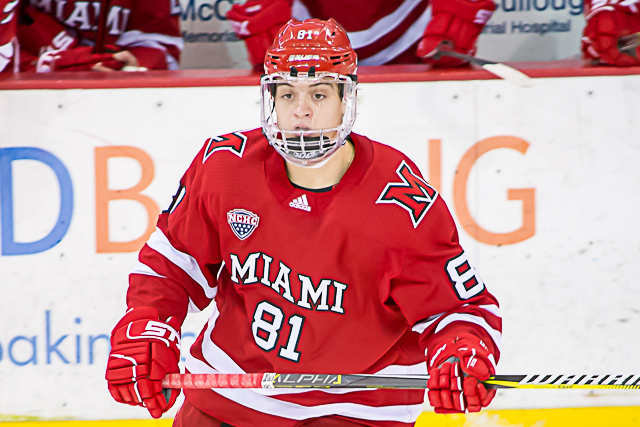 FINAL THOUGHTS: Considering that scoring depth is not Miami’s strong suit this season, the RedHawks have not been afraid to play up-tempo, which has made for exciting games. These teams both had a lot of high-quality chances and Ryan Larkin is better than most at keeping those out of the net. 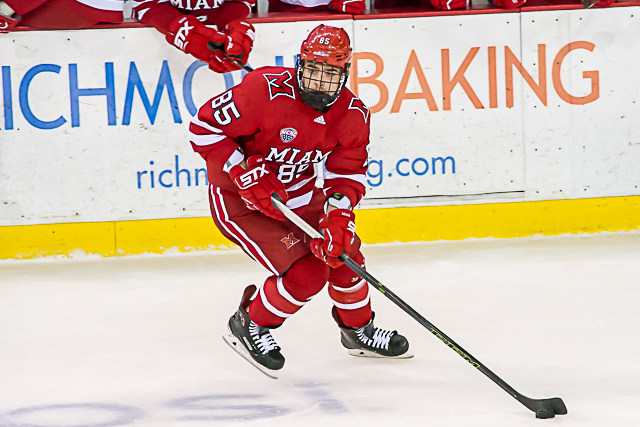 The tie was not the desired outcome considering Miami had battled back to take the lead in the third period, but a Saturday win would give the RedHawks a 1-0-1 weekend and 10-5-1 mark heading into their final first-half series. MU would have to consider five games over .500 a successful first two months. OXFORD, Ohio – It was a bizarre night for Miami’s offense. The RedHawks eclipsed the 240-minute scoreless mark – equivalent to four full games – for the first time in school record, and then scored four times to erase a three-goal deficit in a 4-3 overtime win over No. 12 North Dakota at Cady Arena on Friday. Miami trailed, 3-0 eight minutes into the second period before netting four straight goals, capped off by Ben Lown’s game winner 59 seconds into the extra session. That snapped a five-game losing streak for the RedHawks and a five-game winless stretch vs. the Fighting Hawks (0-4-1). MU had not scored a goal since the first game of its home series vs. St. Cloud State on Feb. 9 and establishing the team record for the longest scoring drought at 240:24. RECAP: Grant Mismash fired a wrister from the top of the faceoff circle that snuck inside the far post through a screen 13:54 into the first period. Christian Wolanin made it 2-0 shortly into a two-minute 5-on-3 on a one-time blast off a feed by Colton Poolman at the 2:17 mark of the second period. Five minutes later, North Dakota (14-11-8) extended its lead to three when Johnny Simonson tapped in a loose puck in the crease after Simonson was denied by Miami goalie Ryan Larkin on a breakaway. After making the save, Larkin was taken out by a pursuing teammate, leaving the net empty for the trailing Simonson. But 48 seconds after that goal, Josh Melnick slid a pass through two defenders to Alec Mahalak in the slot, and Mahalak buried the first marker of his career just under the crossbar on the glove side. The RedHawks (11-17-3) cut the deficit to one when Phil Knies took a feed from Kiefer Sherwood wrapped around the back of the net and tucked it past goalie Cam Johnson 1:42 into the third period. Miami tied it just 2:18 later when Melnick threaded one to Gordie Green at the faceoff dot, and Green’s shot hit a body and popped over Johnson into the back of the net. Grant Hutton stole a puck along the boards and in the same motion batted the puck ahead to Lown on the right wing, and Lown skated into the faceoff circle and went far post for the game winner 59 seconds into overtime. STATS: Lown and Melnick both finished with two points, with Lown going 1-1-2 and Melnick picking up a pair of helpers. It was Lown’s third career multi-point game, and Melnick – the team leader in assists – has recorded at least two five times this season. Knies is now second on the RedHawks in goals with 11. — Miami may have snapped out of its offensive funk, but its power play is still MIA. Despite six chances, this was the fifth straight game in which the RedHawks have not scored on the man advantage. — But the PK has fared better, going 18-for-20 (90.0 percent) in that span. — It was also the fifth consecutive contest in which Miami has failed to score in the first period. THOUGHTS: This was one of those here-we-go-again-is-there-a-nearby-deep-frier-I-can-stick-my-head-in type of starts during which the RedHawks were down multiple goals 22 minutes in and behind three a few minutes after. Larkin probably would’ve liked the first one back and the second was on a 5-on-3, so those weren’t exactly caused by poor skater play. All-world forward Shane Gersich got behind the defense on the third goal, so yeah, that one is on that corps. And Miami outshot North Dakota in the first period – all three and overtime in fact – so it’s not like the RedHawks didn’t show up. That’s what makes this win so impressive. Three-goal leads can snowball, especially against teams like Miami that are struggling for wins. With not much to play for, the RedHawks stunned a Fighting Hawks team that has tons to play for each night. Miami’s fate is nearly sealed in the conference, and UND is fighting for home-ice advantage in the league tournament and is on the NCAA bubble. The RedHawks may be fighting very long odds to get back to the NCAA Tournament, but at least they showed on Friday they are going to fight. — North Dakota may be down a bit this season but this team still skates and moves the puck very well. The Fighting Hawks’ fans also numbered in triple digits. And they were vocal. — Hutton’s play on the overtime winner shows why pro teams are salivating. He stole the puck along the boards and sent a perfect outlet pass to Knies in one motion. If he didn’t get the puck ahead that quickly, North Dakota would’ve had a player in Knies’ face as he penetrated the zone. This guy has a great chance to play in the NHL in a couple of years. — Melnick’s assist on Mahalak’s goal may have actually been intended for Green. Both were between the faceoff circles, and when it slid past Green, Mahalak stepped into it. Miami went back to that play for its third goal, as Melnick fed Green with both in nearly identical spots. FORWARDS: B. Melnick’s passing was at a peak level in this game, as both of his assists came from the corner along the goal line to the edge of the slot. Freshmen Lown and Knies both scored and have both improved drastically as the season has progressed. Knies also blocked four shots. Carter Johnson didn’t get a point but his steal ultimately led to the Melnick-to-Green goal that tied it. Overall this corps was solid defensively as well, especially on the penalty kill. DEFENSEMEN: B+. Mahalak scored, Hutton’s play on the game-winner was amazing and Louie Belpedio picked up an assist on Mahalak’s goal. It was a good night for this group, as North Dakota finished with just 17 shots despite six power plays. The one blemish is that Rourke Russell did get beat on the third UND breakaway that led to a goal, and he also inadvertently took out his own goalie on that play. GOALTENDING: C+. Yes, Larkin allowed three goals on 17 shots (.824), but he faced a handful of Grade-A chances and was taken out of the play on one of those goals. The first one was stoppable, but the second was a 5-on-3 missile from the high slot. He also held UND off the scoreboard the final 33 minutes, allowing Miami to come back. LINEUP CHANGES: Just one: Carter Johnson was back in the lineup while Zach LaValle sat. Johnson contributed to Green’s goal. FINAL THOUGHTS: This is what the second half of the season in this league should be about: Thrilling, well-played games between teams ranging from good to top-ranked. That’s how it was every weekend down the stretch three years ago when Miami won the NCHC Tournament. As a fan, as soon as a game ended you couldn’t wait to get back to the rink the next night or weekend. This season definitely hasn’t gone as planned, but this night was a reminder of how entertaining meaningful games in this league are in late winter. From the RedHawks and their fans’ perspective, the only thing lacking was the standings relevance, as Miami is competing for neither a league title nor home-ice advantage. Hopefully the full stretch-run experience will return to Cady Arena next season. OXFORD, Ohio – Because it was televised nationally, Miami’s game on Friday started a half hour later than normal. Unfortunately the RedHawks didn’t begin play until well after that. MU surrendered three goals in the first 10 minutes in an eventual 5-2 loss to No. 4 St. Cloud State at Cady Arena. Miami (10-14-3) did battle back with a couple of second-period goals but could not generate the equalizer. Colorado College won at North Dakota on Friday as well, leapfrogging Nebraska-Omaha and pushing six points ahead of the RedHawks, who are 1-6-1 in their last eight. The Mavericks are in seventh, four points up on last-place Miami. All eight teams in the NCHC will have played 18 of their 24 league games after Saturday, so regardless of the outcome in the final, MU will head into the final three weekends of the regular season in last place. RECAP: Fans were still filing in when Robby Jackson and Blake Lizotte threw pucks into the net 70 seconds apart, giving SCSU a 2-0 lead just over three minutes in. It was Mikey Eyssimont extending the Huskies’ lead to three at the 9:39 mark. Josh Melnick had a pass intercepted at the blue line, resulting in the first goal, Chaz Switzer was skated around by Lizotte and Kiefer Sherwood blew a tire at the red line when Eyssimont scored. The RedHawks scored 1:47 apart in the second period to cut the deficit to one. Gordie Green banged home a loose puck from the slot after a pass from behind the net by Carter Johnson was partially deflected. Ben Lown put the puck on net by poking it between a SCSU defender’s legs, and the rebound was jammed home by Phil Knies. 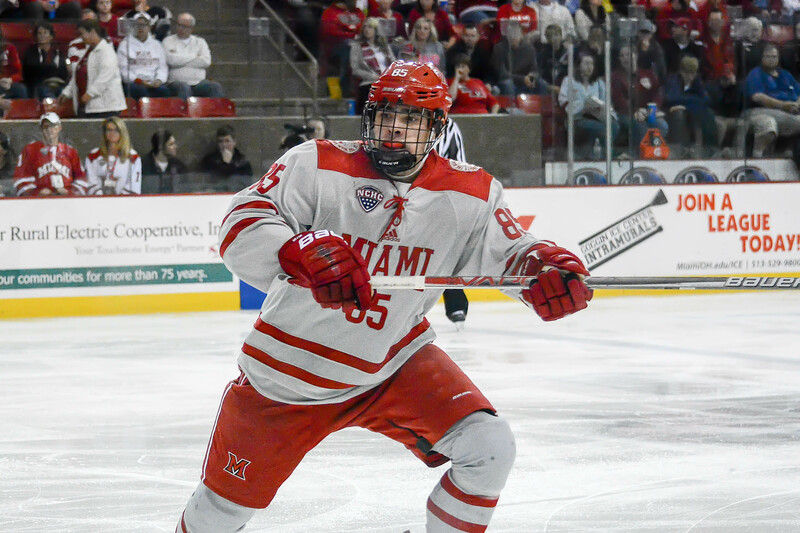 Miami had a couple of chances to tie it late in the second period, but the Huskies iced it seven minutes into the third period when Kevin Fitzgerald stripped Willie Knierim at the blue line and beat goalie Ryan Larkin five hole. The RedHawks pulled Larkin with over six minutes left, and Jackson hit the empty net for the final tally. Miami forward Gordie Green (photo by Cathy Lachmann/BoB). STATS: Green extended his points streak to four games, a current team high. He leads Miami with 12 goals including the one in this contest. — Only five blocked shots for the RedHawks. — Johnson’s assist gives him points in consecutive games for the first time in his career. — Miami failed to score on the power play, snapping a six-game streak. But the RedHawks did not yield a goal on the man advantage for the first time in eight games. — All seven goals were scored in the south end of the rink. THOUGHTS: It’s baffling that the RedHawks wouldn’t be ready for this series, and against a team as good as St. Cloud State, Miami paid dearly. MU tried to battle back and was the better team in the second period, but the damage had been done. And that’s what’s enough to drive one batty with this team. This team is good enough to hang with the best teams in Division I for stretches but not good enough to win those games. — Larkin has gotten some leeway because of the quality of shots he’s faced, but he’s getting beaten too often on stoppable shots – especially high to the glove side – and that’s contributing to MU’s second-half slide. His save percentage of .883 would be the worst of any starting goalie since Enrico Blasi’s first season in 1999-2000. — Johnson is making it harder to keep him out of the lineup. He played 37 games last season and earned just three points and sat the bench almost the entire first half of 2017-18. But he is 1-1-2 his last two games, is providing much-needed energy on the lower lines and is using his size to win battles along the boards. — St. Cloud State has the best transition game of any team to come to Cady Arena this season. The Huskies are able to go end-to-end in a couple of seconds and create odd-man rushes off of opponents’ misses. They definitely are every bit as good or better than on television. — Kevin Fitzergerald made arguably the defensive play of the year when he put his stick up and blocked a would-be third-period goal by Casey Gilling at the side of the net. The goalie would have had no chance. — For the second straight game, Miami had a major power play in the third period with a chance to get back into a game and did bupkis with it. The PP1 has been solid all season but the RedHawks haven’t been able to put together a solid secondary combination of skaters for extended man-advantage opportunities. FORWARDS: C-. Three bad turnovers ended up in Miami’s net, negating the two goals this corps recorded. DEFENSEMEN: C. Tough call here. Didn’t give up too many great scoring chances except for the second goal, didn’t contribute anything offensively. Grant Hutton was definitely the star of this class. GOALTENDING: D. Larkin needed to stop at least one of the goals allowed, especially early when the game was in the balance. He has tons of talent but it’s unclear if he’s struggling because of the high number of minutes played or a waning confidence level after facing so many Grade-A chances. LINEUP CHANGES: None. This was the third straight game Blasi started the same 19. FINAL THOUGHTS: St. 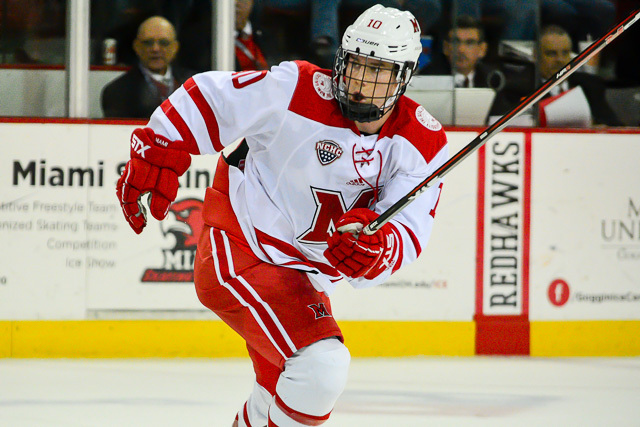 Cloud State (18-6-3) is a force and should contend for the national title. The Huskies played like champions in this game, taking the crowd out of it early, fending off Miami’s rush in the middle portion of the game stepping on the RedHawks’ throats in the end game. SCSU is fast, handles and moves the puck exceptionally well and still manages to limit opponents’ opportunities despite playing an up-tempo style. And the Huskies were missing a defenseman who is playing for Team USA in the Olympics. Fortunately this is one of the two NCHC teams the RedHawks only play twice this season. In a game that saw half of Nebraska-Omaha’s skaters find the net, it was only appropriate that the final tally was credited to goalie Evan Weninger. That capped off the Mavericks’ 11-7 win over Miami at Baxter Arena on Friday, as UNO set a school record for goals and the RedHawks gave up their highest total in over two decades. Down 4-1 early, Miami battled back to within one and continued to fight – at least offensively – until the final horn. But MU could never generate the equalizer. This was certainly not the way the RedHawks wanted to start a stretch of four straight road games as they hang on the PairWise bubble. RECAP: For a game that featured 18 goals, believe it or not none were scored in the first 10 minutes. Grant Gallo and Jake Rudolph netted consecutive markers to make it 2-0, and after Miami’s Kiefer Sherwood scored on the power play, UNO potted two more in a 41-second window to close out the first period with a three-goal lead, with Tristan Keck and Joel Messner hitting the net. The RedHawks (9-10-2) cut it to one on a blue-line blast by Louie Belpedio and a freshman-to-freshman connection of Phil Knies to Ben Lown. But four more shots found their way in the final seven minutes of the middle stanza, with three coming by the Mavericks, sandwiching Knies’ second marker of the night. Gordie Green scored off a Karch Bachman feed early in the third period, but it was the final gasp for Miami. Back-to-back UNO goals seven seconds apart made it a four-goal game, although Lown and Casey Gilling did record goals for the RedHawks in the final 11 minutes of regulation. MU goalie Ryan Larkin was lifted after allowing six goals, and backup Chase Munroe was actually credited with the loss for giving up the final four, even though Miami never tied the score. STATS: The RedHawks were actually the Redskins the last time they allowed this many goals in a game. MU lost, 13-0 at Michigan on Dec. 6, 1996, and had never surrendered double-digit goals under current coach Enrico Blasi. – A pair of freshmen – Lown and Knies – set career bests with three points each. Knies scored twice and Lown went 1-2-3. Grant Hutton picked up three assists, also his high total as a RedHawk. – Gilling and Sherwood both extended their points streaks to four games, tied for the longest on the team. – Miami scored three times on the power play, reaching that mark for the fourth time this season. – The flip side? The RedHawks had not given up more than two PPGs in any game in 2017-18. They allowed four on six chances in this game. – Seven Miami players finished with multiple points. Ten picked up at least one point. Four Mavericks ended the night with at least four points. – The three goalies’ combined save percentages were .707. Their goals-against averages were 8.76. Oh I know, how about Miami’s complete lack of defense? Bill Clinton was in his first term as president the last time the RedHawks gave up this many goals in a game. There’s plenty of blame to go around in this area. They won 46 percent of their faceoffs, losing some key ones in the offensive zone that led to goals. 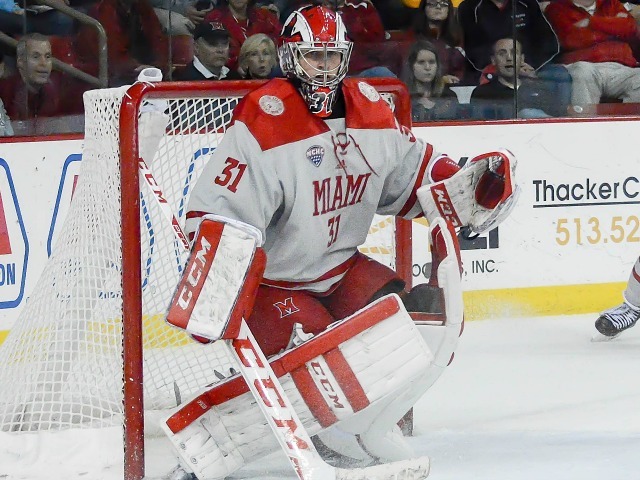 A common theme, too few UNO players paid any kind of price for setting up at the top of Miami’s crease. One Nebraska-Omaha goal – forgive me for not being to recall which one of the 18 it was – saw a player carry the puck from behind the Miami net to the side of the cage and take a shot and a follow-up backhand that went in with no red jersey in sight. Too many blown assignments, with UNO players not picked up in Miami’s offensive zone. And there’s 22 of 32 shots saved by the netminders. Ryan Larkin had an off-night for sure, going just 15-for-21, but Chase Munroe looked rusty as well, stopping only 7 out of 11. It was Munroe’s first appearance of the regular season, although he did play in the exhibition vs. Team USA in mid-October. Miami has built a reputation of defensive excellence under Blasi, but D definitely took the night off. – Freshmen combined for nine points, with Knies and Lown tallying three each, Gilling picking up two and Alec Mahalak notching an assist. All seem to be getting better as the season progresses. – Sherwood’s four-game point streak is inspiring, as he seems to have shifted into a higher gear recently. He had picked up points in just three of Miami’s first 17 games and had seven overall after that span. Sherwood went 14-24-38 last season, tied for the team lead in goals and second in both assists and points. LINEUP CHANGES: Two up front and one on defense. Ryan Siroky sat for the first time since early October, as did Austin Alger, who had dressed for the last four. Willie Knierim was back on the ice after being scratched last Saturday, and Christian Mohs occupied the last forward spot, logging just his seventh game of 2017-18. Rourke Russell was benched for just the third time this season. Grant Frederic, who had been out of the lineup three straight contests, took his place. FINAL ANALYSIS: It would be tough to imagine the coaching staff being anything but irate after this effort. Granted Miami did continue to fight after falling behind three early, but falling behind three early ultimately led to the RedHawks’ demise. Grant Valentine didn’t exude confidence based on his relief appearance in net earlier this season, and Munroe, ditto. That’s a problem, because if Larkin gets hurt or struggles in a game, Miami’s choices are limited. Of course, we’d expect Valentine and/or Munroe to play better if either was called upon on more of a regular basis, but it’s pretty obvious that barring injury the odds are Larkin will start every regular season game. Miami is now under .500 for the first time since late November, and its path to the NCAA Tournament will become smaller with each loss down the stretch. OXFORD, Ohio – Starting goalie Ryan Larkin logged 20 scoreless minutes, the Green-Melnick-Bachman line is a quasi-permanent thing and no one got hurt. 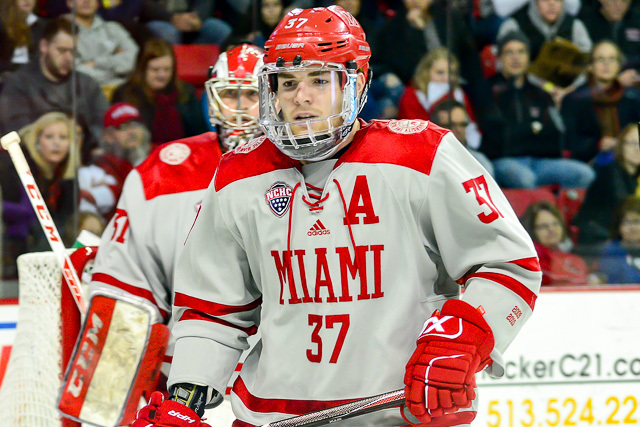 Those are the headlines from Miami’s 8-2 exhibition win over the University of Windsor at Cady Arena on Saturday. To address the relevance of this meeting first though: This game was a well-scheduled tune-up for the RedHawks, whose last game was three weeks ago. That’s a long time to go between contests in any sport. Plus in recent years, Miami has struggled in the games immediately following Christmas break. This way, the RedHawks could get its regulars ice time and allow others to earn experience by logging valuable minutes as well. The downside to NCAA-CIS (Canada’s version of the NCAA) matchups is CIS teams play more of a pro style of hockey. Meaning half-shields instead of cages and more importantly, an increased tolerance of chippiness. That addresses the final headline point: No one gets hurt, and additionally, no one gets suspended. It can seem like there’s little upside to these exhibitions. Anyway, on Larkin: He played the first period, presumably to knock off any down-time rust. Good call by the coaches to keep him sharp without overusing him during a season he’s clearly destined to log almost all of Miami’s minutes between the pipes. Chase Munroe played the second period, Grant Valentine the third, as both of Windsor’s goals were scored under Valentine’s watch. Then there’s the first line: Karch Bachman joined Josh Melnick and Gordie Green at the end of the Cornell series, and they were together at Western Michigan and again in this game. They combined for three goals and five assists, with each tallying at least two points. Melnick recorded a game-best four points on two markers and a pair of helpers. Bachman has blazing speed and a super-quick shot release, so he provides another sniper on the first line, and he has also moved into a penalty killing role this season. He is 3-6-9 this season after racking up just six points his freshman season. Green and Melnick – should we call them Grelnick? – clearly make this offense go, and being the third member of their line is a privilege. 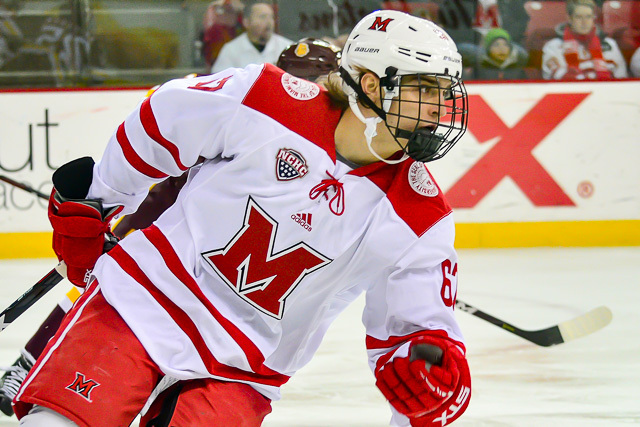 – To catch up: Decembers are tough in this part-time writer’s full-time vocational field, thus the lack of content here, but Miami split its final two NCHC games at Western Michigan, winning 5-2 on Friday and dropping a 4-3 overtime decision in the finale. Saturday’s loss was tough to accept, as the RedHawks led 3-1 in the second player before allowing a natural hat trick – with the latter coming in overtime. That was the second time in three weekends Miami saw a Saturday outcome flipped. The RedHawks also ended up tying Bowling Green on Nov. 25 on an extra-attacker goal with 38 seconds left. 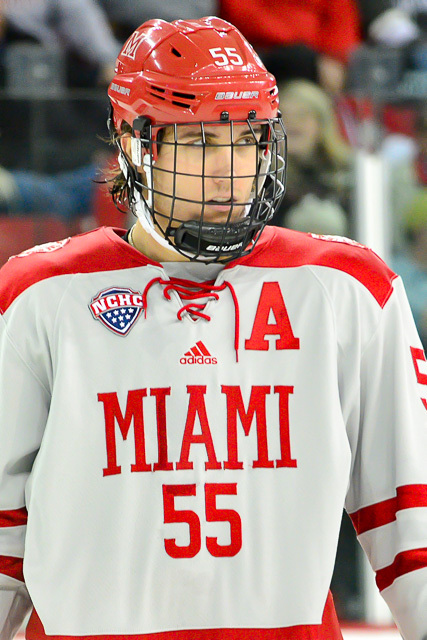 – Miami is currently sixth in the NCHC with a 3-4-1 league record, although the RedHawks have played two fewer games than all of the top five teams. MU has completed its non-conference schedule, as its remaining 16 regular season games are all against league opponents. – Perhaps the best news is that Miami is 17th in the PairWise rankings, which ultimately determine which teams qualify for the NCAA Tournament. In a 16-team Division I tournament with at-large bids, typically a PairWise rank of 12 or 13 is considered safe. – Love the toughness from Chaz Switzer, who blocked a slap shot in the leg and returned after a brief stint in the locker room, and Conor Lemirande, who needed facial sowing after scoring a goal but returned. – Also love the game-to-game improvement by Ben Lown. The freshman scored and picked up an assist. 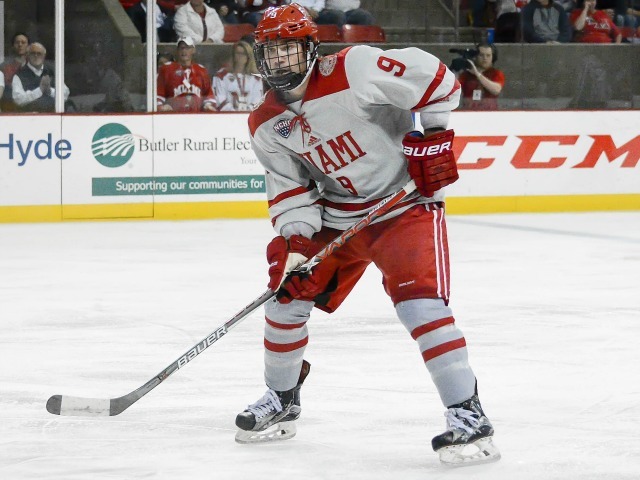 – Miami had 21 skaters for this game, three more than is allowed in NCAA play, and forwards Christian Mohs and Zach LaValle and defenseman Grant Frederic were listed as the extra bodies. F Carter Johnson, F Alex Alger, D Bryce Hatten and G Evan McCarthy were the only RedHawks who did not dress. – Denver’s up next. The Pioneers are No. 5 in the PairWise and second in the USCHO poll. Big two games in Oxford this Friday and Saturday. OXFORD, Ohio – If Friday’s conference opener was any indication, this could be a fun NCHC season. 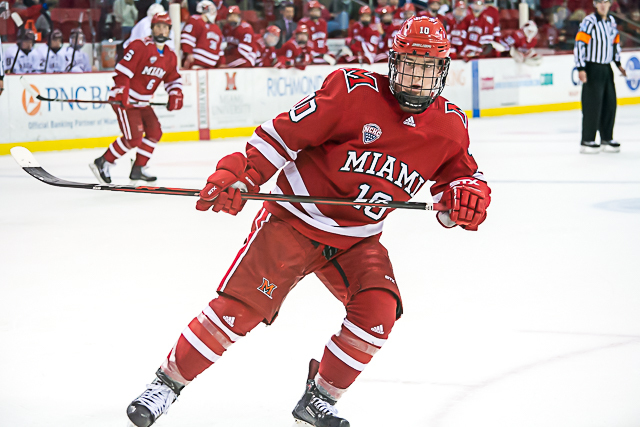 Miami led by one then trailed by one, scored the tying goal with 51 seconds left and the winner in overtime of a 3-2 victory over Colorado College at Cady Arena on Friday. No one expects this to happen 100 percent of the time when games are close, but this is two games in a row in which the RedHawks faced adversity late and killed it. Last Saturday, Connecticut had all the momentum heading into the third period and Miami came out with three quick goals to shut the door. There have been a number of similar games the past few seasons in which the final outcome has gone the other way, and 6-on-5 has been RedHawk kryptonite. MU entered this four-game homestand 1-3 and has won three much-needed contests in a row to pull a game over .500, and the RedHawks have a chance to sweep the four-game set and its first NCHC series of 2017-18. The way Miami has played late in the past two games, things are definitely looking good heading into the RedHawks’ home finale. – It was a well-played game by both teams, and as expected, CC is much better than in past seasons. Obviously the ending makes that easy to say, but the quality of play was high even in those first two fairly-uneventful periods, especially considering it’s still early November. – Colorado College scored both of its goals on the power play. The interference on Rourke Russell was the right call, but Grant Hutton barely contacted a player with the puck and was whistled for tripping. The officiating was pretty inconsistent, and the Tigers received six power plays to Miami’s two. – Ben Lown is currently the third member of the top line with Gordie Green and Josh Melnick, and he proved deserving of that role with the centering feed to Melnick for the overtime winner. Like several of the other freshmen, he seems to be gaining confidence with each game. – Three RedHawks took at least eight faceoffs, and all had winning records. Melnick was 15-13, Casey Gilling finished 13-7 and Kiefer Sherwood won six of eight. Overall Miami was 39-29 on the night. – Green and Melnick both have five-game points streaks. Green has all of his team-best 13 points in that span (4-9-13), and Melnick is 2-6-8. Louie Belpedio has three goals in his last two games, and Melnick has goals in consecutive games as well. FORWARDS: C+. Melnick and Gilling both found the net, but this corps combined for just 15 shots and four of its five minor penalties resulted in CC power plays. Ryan Siroky dished out a pair of huge hits, but Miami didn’t get much offensive production from its bottom three lines. Kiefer Sherwood and Carson Meyer combined for just one shot, and Karch Bachman had three – including some high-percentage attempts – as the third member of that line, but he appears somewhat snakebitten. DEFENSEMEN: B+. Belpedio juked at the blue line and wired one home for one of the goals. Colorado College generated 30 shots but 11 were on the power play. Chaz Switzer stopped a 31st and a would-be goal when he blocked a shot at the top of the crease while goalie Ryan Larkin was scrambling to get back into position. GOALTENDING: B. Twice Larkin sprawled across the goal mouth to stop A-plus chances, and he was 28 of 30 overall (.933). One of the shots slipped through in heavy traffic, and both were on the power play. Larkin had allowed 16 goals the first four games but has surrendered just three in his last three starts. LINEUP CHANGES: None again. It’s the third straight game the same 18 skaters have dressed, and Larkin has been between the pipes for the start of all seven of Miami’s contests. 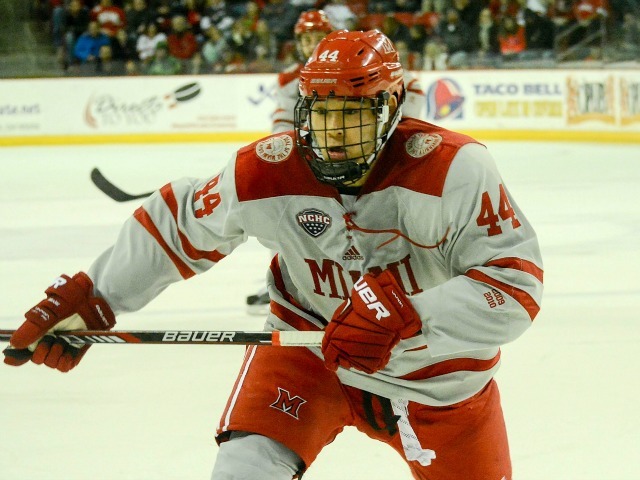 Four forwards and two defenseman join the Miami program this fall. Plus Christian Mohs enters his redshirt freshman season after injuring himself prior to 2016-17. All of the incoming freshmen played their juniors hockey in the USHL, the top such league in the U.S., and Mohs thrived in the NAHL. BoB takes a look at the new faces in Oxford this fall. F Ben Lown, Omaha (USHL) – A product of the prestigious Shattuck St. Mary’s (Minn.) program, he scored 70 goals in two seasons in their youth development program. He logged the majority of 2015-16 in the NAHL and played his first full season of USHL hockey last year as an 18-year-old with a brutal Omaha team, going 11-12-23 with a minus-25 rating in 51 games. He’s super small at 5-feet-7. F Christian Mohs, Minot (NAHL) – Mohs blew his knee out prior to last season and was reshirted. He played high school hockey for three years in his native Minnesota, and after a year of NA3HL, he joined Minot for 2015-16. In two seasons there he racked up 101 points in 118 games, including 35 goals. Mohs is already 22, so he has plenty of experience, but the question is how well he will do when he puts his repaired knee to the test. With hockey players, it often takes time to regain confidence. F Casey Gilling, Muskegon (USHL) – Gilling played his first full season in the USHL in 2016-17, and he racked up 15 goals and 18 assists in 33 games, thriving after playing the previous season in the NAHL. He has good size for college at 6-feet-1, 185 pounds. He’s still just 19 and has over two full seasons of juniors experience under his belt. F Phil Knies, Sioux City (USHL) – Knies was actually born in Slovakia but grew up in Phoenix. Another small guy at 5-9, 170, Knies thrived in his second USHL season. He scored 21 goals, set up 20 more and was plus-17 and picked up 10 points in 13 playoff games as Sioux City was a Clark Cup finalist. F Austin Alger, Muskegon (USHL) – The younger brother of teammate Alex Alger, Austin recorded 43 points in 57 games last season with Omaha and Muskegon. It was his second season in the USHL and he nearly doubled his point rate over 2015-16. Alger is almost identical in size to his brother at 5-11, 167. He was named Mr. Hockey in Michigan his senior season of high school prior to his USHL career. He scored 86 goals in four prep seasons. D Alec Mahalak, Youngstown (USHL) – In his first USHL game, Mahalak recorded three assists. That was the only contest he would play in for Youngstown in 2015-16, but he logged 58 games last season and tallied 23 points, including five goals. Mahalak is definitely small for a defenseman (5-9-171) but has good puck-moving skills and will hopefully be able to quarterback the power play at some point. D Rourke Russell, Green Bay (USHL) – Last season, Russell made the jump from NAHL to USHL and thrived, dishing for 10 assists and recording a plus-15 rating in 59 games for Green Bay. He’s never scored a lot at any level but has a reputation as a solid shut-down guy. He is still building much-needed muscle for bone-crunching NCHC play. Russell is 6-1-176 and has a great hockey name.